Ocean Stoke Art Show this weekend. Original Piece Up for Bid — Nathan Gibbs Surf Art & Design. "Ecuadorian Beach Break Sunset" by Nathan Paul Gibbs, 19" x 12" acrylic on birch panel. Artist Description: The beauty and the fragility of the Eastern Tropical Pacific Seascape is unmatched. Too soon can we lose what we have. This painting reflects that 'time is setting' on this regions ecology. While like a sunset, it is beautiful, it only last a short while. About The Eastern Tropical Pacific Seascape: Covering nearly 2 million square kilometers (770,000 square miles), the Eastern Tropical Pacific Seascape comprises the waters, coasts and islands off the shores of Costa Rica, Panama, Colombia and Ecuador.The islands and waters along the Pacific coast of Costa Rica, Panama, Columbia and Ecuador are highly productive areas of the Eastern Tropical Pacific (ETP), belonging to one of the world's most diverse biogeographic provinces. This region has a high degree of, productivity, diversity, and ecological connectivity as well as complex oceanographic characteristics, primarily due to the convergence of major marine currents. This region also experiences cascading impacts from El Nino and La Nina events, compounded by human use impacts. It’s a special place — one where you’ll find bigger populations of many species than you would anywhere else on Earth. It attracts thousands of visitors every year. It’s one of the most productive fisheries in the world. And it’s too important for humanity to lose. 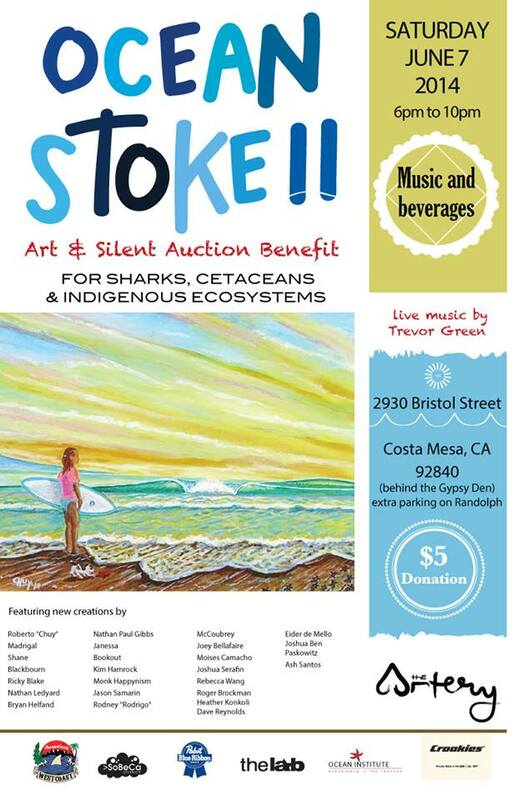 Ocean Stoke II: Art & Silent Auction Benefit for Sharks, Cetaceans & Indigenous Ecosystems. Check in here for my random thoughts and information about my artistic journey.